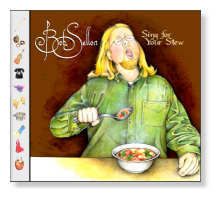 (Bob Sellon describes how the "Sing For Your Stew" CD and web site were put together. ) Also see StecWorkshops.com. Sing For Your Stew was not a solo effort. Ultimately, a great many people contributed to it both directly and indirectly to the project (see my "thanks" page). Most notably, my good friends Chris Holt and Bruce Alger lent me a critical ear thoughout much of the project. This was a huge help especially during the early song selection stage. I didn't have much of a budget so they needed to be songs I could record at home and perform live since I didn't have a band for recording or gigging (promotion, etc..). The list of candidate songs was about 20 long which we boiled down to 13 or 14 strong candidates. Of that, several were proving difficult to record satisfactorily so I ended up with the 10 that appeared in the released CD. 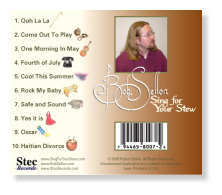 At the time I made this CD, I did not play with a regular band so test recordings needed to be made of all the tunes. Adjustments were made to tempo and key and the question of "Click or no click" was answered on a song by song basis (If I was a better drummer, I would have recorded more of the tunes without a click). I even created test CDs of the preproduction versions of the songs. In fact, I created literally dozens of test disks over the course of the project. This was in the early days of portable mp3 players so I had to create CDs to test new versions of the songs in the car and on other systems. Though most of the sounds that are heard in this CD were recorded in 2003 and 2004, some of the tracks for Safe and Sound were recorded more than 10 years earlier on one of the worlds first professional disk-base audio recording systems, "Opus" by Lexicon. The sound quality was impeccable but only 16 bits deep as supported by Opus at the time (usually a minimum of 24 bits is used to record source material these days) and had to be digitally transferred to a Tascam DA38 digital tape machine then transferred from there to PC via the TDIF interface on a Spirit 328 digital mixer. Most of the tracks, however, were recorded directly to a PC running Windows XP and Sonar V2.2 from Cakewalk. My timing is not that great so most of the tracks were recorded using a click at a fixed tempo. A notable exception is Haitian Divorce which sounded terrible against a click. Subtle variations in tempo, it turns out, we're a big influence on the energy levels of the test recordings so the track was ultimately recorded without a click. Given the complexity and subtly of the song arrangements I was going for, I really couldn't afford the rehearsals for a drummer so I ended up playing the drums myself. Though I like to play the drums, I just don't play enough to keep my timing tight so I ended up doing a lot of editing of the tracks to get the feel of these tracks right. Playing against a click was a big help here since it allowed me to see exactly how much ahead or behind the beat I was at any particular time. Burnout was a huge problem on this project. In addition to playing drums and lead vocals, I also played bass, electric guitar, acoustic guitar, keyboards and backing vocals on all the tracks. Each part had to be written so I literally listened to the songs dozens of times for each part. Being so close to each of the tracks on each song made it very difficult to evaluate takes and the overall groove of the songs objectively. When I listen to the tracks now, several years later, I'm amazed that I was able to make some of the songs sound fresh given the number of times I heard them. The number of listens goes through the roof when you start mixing. Most of the original test recordings used electronic drums and bass parts, usually played on a MIDI keyboard. I prefer not to use drum loops for my tunes since they steer the song in a particular direction (usually repetitive and dull) which steal the magic from a song. I like to coax subtle grooves out of a song that drum loops just plow over. This is a personal thing. Many people like a nice solid repetitive beat but this gets old for me real quick. One of the greatest joys I got out of this project was finding subtle hooks and grooves in these tunes. "Fourth of July" was originally just strummed. The great hook in that tune emerged when I was writing the bass part. I don't have the greatest drum kit in the world (a jr. Jazz Ludwig set), or the greatest mics so I had to do a lot of cleanup and triggered replacement of the drum sounds. I was also engineering the session while performing so it was difficult and time consuming to test mic positions. This recording uses a lot of close mics but these days I'm recording with a matched pair of mics overhead and just use the individual drum tracks (kick, snare, etc..) to beef things up in places. In addition using triggered replacement of kick and snare, I used a lot of companding on all drum channels except for the cymbals. Companding is just a combination of a compressor and expander. The combination is like a gated signal with compression. A lot of times, these tracks were just used to feed the verb or delay. Allows you to have a lot more reverb or delay on the snare, for instance, than the kick. The amazing Bruce Alger stepped in to bring "Cool This Summer" to a whole new level. My old band-mate Brian Templeton came down for a few sessions including the harp track on "Ooh La La" and accordion on "Rock My Baby". For my recording setup, I was able to move the PC running Sonar out of the room to prevent build up of cooling fan noise on the tracks. The PC has an RME PCI card with three ADAT optical inputs and outputs for a total of 24 tracks in and out. My Spirit 328 mixer only provides 2 ADAT optical ins and outs for a total of 16 which match the number of mic preamps on the board. The board is passively cooled (no fan) so I was able to keep that in the room with me while recording. I ran the optical cables through a hole in the wall along with the keyboard, mouse and monitor cables. Most of the time I was only using one channel in and two channels out for a stereo mix. Drums of course required multiple channels at once but most of the tracks were recorded one at a time. The bass was always recorded direct in. I basically plugged the bass into the line input on the board. This did require a LOT of tweaking in the mix to sound acceptable however. I ended up using the Revalver amp simulator plug in to get a natural sounding bass. The bass itself is an Ibanez that I picked up a few years back and like a lot. An interesting side note: after "finishing" the recordings for the CD, I had to wait a few months for the CD cover and artwork to be completed. Having heard the songs literally thousands of times, took a break from them till the artwork was almost done. When I listened to the tracks again after a couple of months I found that the bass guitar was too loud on EVERY TRACK. Go figure. All of the vocals on this project were recorded with an AKG 4000B mic.I typically hung the mic a foot or so in front of me and plugged it directly into the 328 board. Bad acoustics in my recording space made it very challenging to place the vocals properly in the mix but considering the circumstances, I'm pretty happy with the results. I've since created a bunch of small acoustic isolator panels that I use to help dull down the room when recording. Though I would have loved to do all of the background vocals live, I ended up just using the test harmonies I created with the TC Helicon Voiceworks on many tracks. There were a lot of interesting things that went into each song so rather than lumping all the information into a single page, I've created separate pages for each song with details. Refer to the Songs page for the list. I mastered this project using a piece of software called T-Racks which includes an EQ, a compressor and a multi-band limiter. Though I didn't need to do much to the Sing For Your Stew tracks, I've used T-Racks to savage some pretty lousy tracks with great success. T-Racks also converts the 24 bit master files into 16 bit files which can be used on audio CDs and are typically used to create MP3s. One of the great things about T-Racks is that you can save all the settings for each song. For Sing For Your Stew, I created separate T-Racks project files for each song which I tweaked as I listened to the mix in cars and through various speakers and sound systems. You just pick up where you left off instead of starting from scratch each time. Huge help. Note - Visit the Stec Records Recording Workshop for more information about how we record music.